Steven Spielberg's classic sci-fi story of interplanetary friendship makes a perfect picture book for the whole family. When E.T. the Extra-Terrestrial was released in theaters back in 1982, its bittersweet story enchanted millions. Now the cinematic blockbuster is transformed into an illustrated storybook, with colorful, adorable drawings by Kim Smith. Here is a story you can't help but love: After E.T. is stranded on Earth, he takes refuge with Elliott, a boy in need of a friend. Together they find a way to help E.T. get back home. Along the way, both child and alien learn important lessons about courage, friendship, and the power of imagination. This is the perfect read-along story for children, their parents, and E.T. fans across the universe. The E.T. 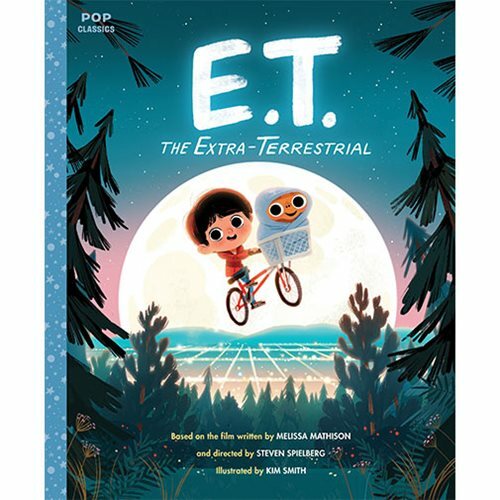 the Extra-Terrestrial: The Classic Illustrated Storybook Hardcover Book makes a great gift for fans. This 40 page book measures about 11 3/10-inches tall x 9 2/5-inches wide.